We went into Vodafone a couple of days ago after our old Sony phone finally gave up the ghost and came out with a Nokia N95. 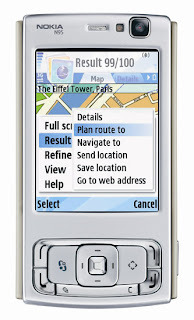 The N95 has been reviewed on many sites for its various multi-media/wi–fi/photographic abilities but what opened up our thoughts to move over to a Nokia was the built in GPS. If you own a N95 one of the first things you should do is download the recently released free application ‘Sports Tracker‘ from Nokia. Sports Tracker is aimed at the sports or general user on foot or cycling and more importantly it provides full route tracking with the ability to upload to Google Earth. The ability to create tracks for Google Earth/Maps in a small portable portable phone is impressive. On our first test run we used the Sports Tracker application on a drive across Berkshire (its meant to be used for running or cycling but it does the same job in a car). The N95 performed well considering it was placed well inside the car, rather than on the windscreen as with most in-car GPS systems. After you have reached your destination you can simply choose to ‘Save as Google Earth’ and then transfer to your PC. Once in Google Earth a variety of information points are provided on your travel speed as well as your highest and lowest altitudes. We have only touched on the basic level of functionality here but the N95 GPS comes highly recommended, it is definitely a step forward in Google Earth tracking for the general consumer. Sports Tracker is pretty neat – one thing it adds to the kml though is your fastest speed… which might have caused the motorway police to take an interest?. Thats a good point it raises the question of posting paths. I cant comment on the speed..i assume it is a gps error… ! Does the N95 Automatically Geo-Tag your photos taken on the phone? That’s the feature I’d be most interested in. Nokia Lifeblog (for N-series phones) doesn’t geo-tag with GPS (I don’t think), but does tag all photos with the Cell ID, which for cities at least is a reasonably small area. how about posting current position (e.g. to twitter) in real time? That would allow some interesting live tracking possibilities. great toy .. just got one ourselves down in nz .. have you got it to geo-ref pictures yet? .. thought this would be an obvious feature!?! How have you found the battery life when just logging a track, so not using it for navigation ? I’m interested in using it for mountain biking and being able to look up where I’ve been and back track if possible. For your experience would this seem possible ? p3t3 .. I’m taking mine out for an MTB this avo thru the local forest, so will let you know. wow .. worked amazing, way better than NAVMAN C60 .. even thru dense tree sections .. bit nervous with $ worth of hardware in back pocket .. will post kml at http://www.zno.co.nz .. still working on the auto geotag of photos. Cool, look forward to seeing it. Take a look over at http://www.n95users.com. If they havent answered your question, just make a new thread. I just signed up over there and it seems to be the most active dedicated N95 community. What is the best accuracy the GPS is capable of? I assume accuracy of approx 10m – although of note is that the map navigation trys to pin you to a road which lowers accuracy for off road usage.. I have connect my N95 to my indash dvd player to the 7inch flip out screen using the av cables…the gps is not accurate at all…when im on the highway it seems to jump to little streets that run paralell to the highway…it does not have the sIRF-STAR III ship it has a lot of features in thos phone but it is a master of none!!!! Can i connect the n95 to my laptop and do live tracking on my gps software instead of the n95 ? usually this is possible with garmin systems. where is the best place to put the phone wile mountaing biking? I just uploaded sports tracker to my N95 and tried it out. It seems like a basic question but I can’t see what you are supposed to do once you have KML file-How do I export to PC and how do I view on Google Earth? I’d love to use the software but can’t find any help files and you guys have obviously cracked it!!! Do I download KML file to PC Suite or just save anywhere? It says export file to Google Earth on phone-is that the option I choose to put it onto PC? How do I upload file into Google Earth once it’s on PC? KML is Google Earth’s default file type, you can just use “File” -> “Open” to read it. It’ll pan and zoom to see the path you’ve added. I also did some experimenting with this app (check http://www.whatstosay.com/SportsTracker_Nokia_N95). You can also open the KML file in maps.google.com and in http://www.takitwithme.com. The latter site even lets you upload the route back to your GPS device. I’ve found Shozu, that let’s you upload photos geotaged, videos, etc etc. So you drove at 87mph on the M4, that must have been more like 95mph on the speedo. Not very nice for peole who take the trouble to stick to the limit for peoples safety ie our lives..
i don’t know if anyone posted this question before,but i’d like to find out is it possible to activate n95 gps via internet and if yes,then what has to be known (ip,imei whatever..)? i’m asking,cos i need to find my phone. thanks! Hi, You can get live tracking at http://www.transportlines.com for free, you can also create other users under your own account. Good for small businesses. The GPS is really GPS, not some assisted-GPS that Sprint and Verizon have in their phones. That means you can really navigate with it, like I did, to streets around SF I wasn’t too familiar with. It looks awesome from above. GPS has really made the life simpler for many of us. I am sure that in time to come we will see more magical glimpses of the same.